This will be the first article from series in which I will share with you my experience, thoughts, gear information and ideas on how to ably and fast paint miniatures. My idea of fast painting is to make miniatures look good with minimum required time invested in the process. It’s not always going for minimum tabletop quality because sometimes with just a little of additional effort you can get much more better final effect. I wil aim within this series of articles to write about everything I came to and worked out for myself within years of painting miniatures – so think about it more like looking on experience of fellow hobbyist rather than article expert. My perspective is to get into every detail, even very basic ones, so everyone can find here something for themeselves. 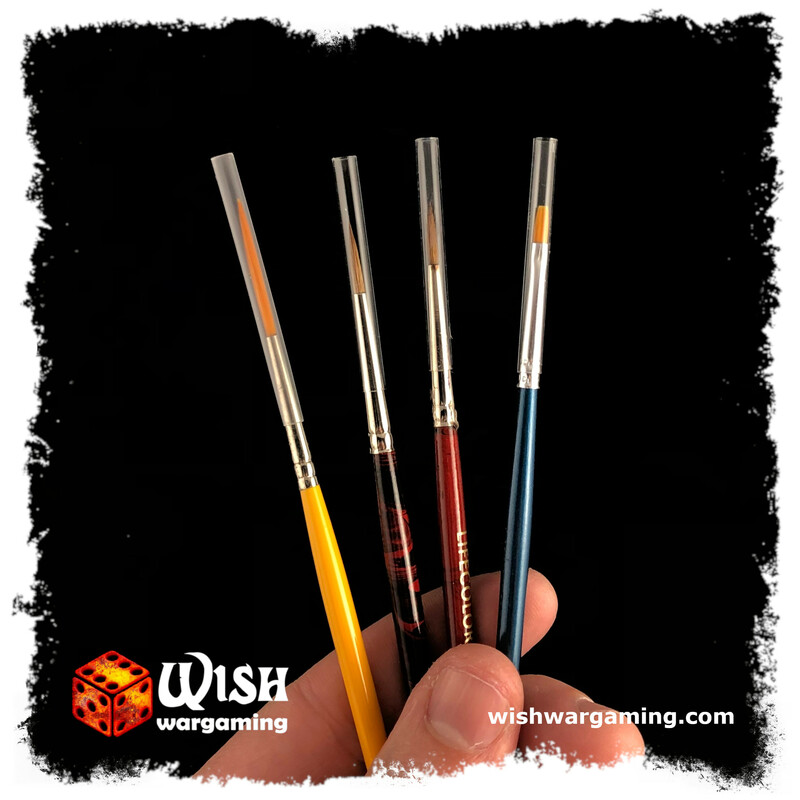 I’ll start from the very basic tool that every miniature painter must have – a brush. Brush is probably one of the first thing you’ll get when you decide to start painting miniatures. When I decided to go into this hobby in mid ’90s, in my area there were almost no real choice except stuff you could find in shop for artist. Main aim was to find smallest brushes possible, sometimes cutting 50% of bristle to get something to paint. It really did not matter what kind of hair or it lenght was. Nowdays it’s far more easier – you can order any time online different sizes and types dedicated to different painting techniques, not to mention color, handle or shape. Kolinsky Sable type hair, are the best thing you can get in my opinion – they’re superior in maintaing their shape during painting and holds their natural tip for a very long time (it’s spring rate is very high). I find this kind of brush hair more soft and flexible during painting, which works very good for highlighting, details and free-hand. Only con I see with this brush is usually higher price (over 5-10 EUR) for good quality ones. If you take a look at synthetic ones, they’re much more cheaper and still you can paint everything with them. They are perfect tool where you don’t need to pay attention to details. That is for example applying base colors to miniature or adding shades during wash. Bigger flat ones are perfect for vehicles, walls and every kind of heavy-duty work. Their durability is lower than those with natural hair. That’s not a problem because after it will loose its sharp tip you can easily cut its end to get shorter and more square brush, which will be ideal for drybrushing. 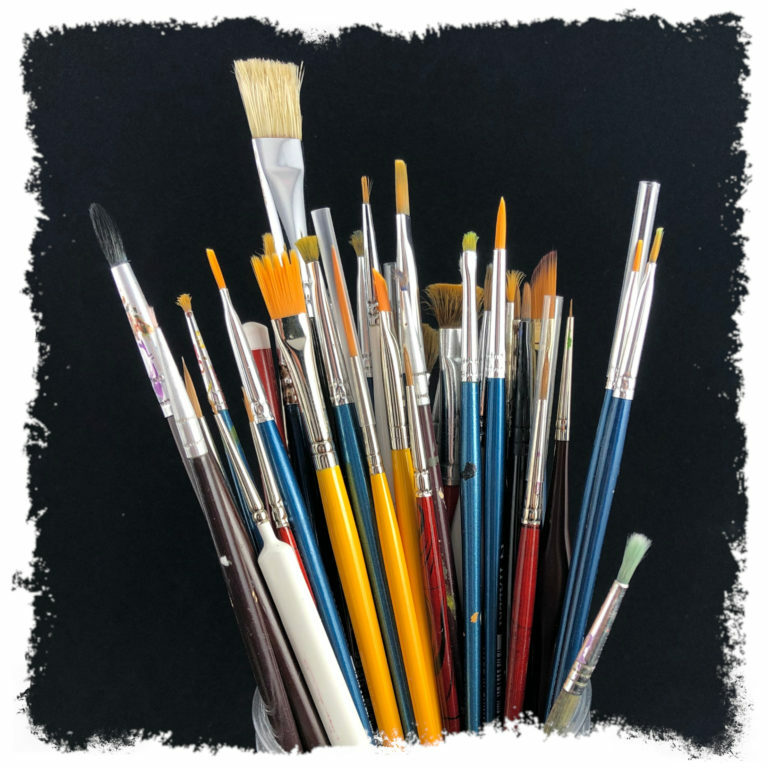 From my experience with different types from different companies I see one dependency – synthetic brushes tends to loose tip fast, no matter the price. One thing worth to mention is that I have that opinion for small and medium sized brushesh from price range around 1-8 EUR. I never tested synthetic brushes more than that price, because over 6-10 EUR you can get very good quality Kolinsky Sable brushes, so why search for others? Flat standard – works good for painting large surfaces like vehicles, walls, dred armour etc. 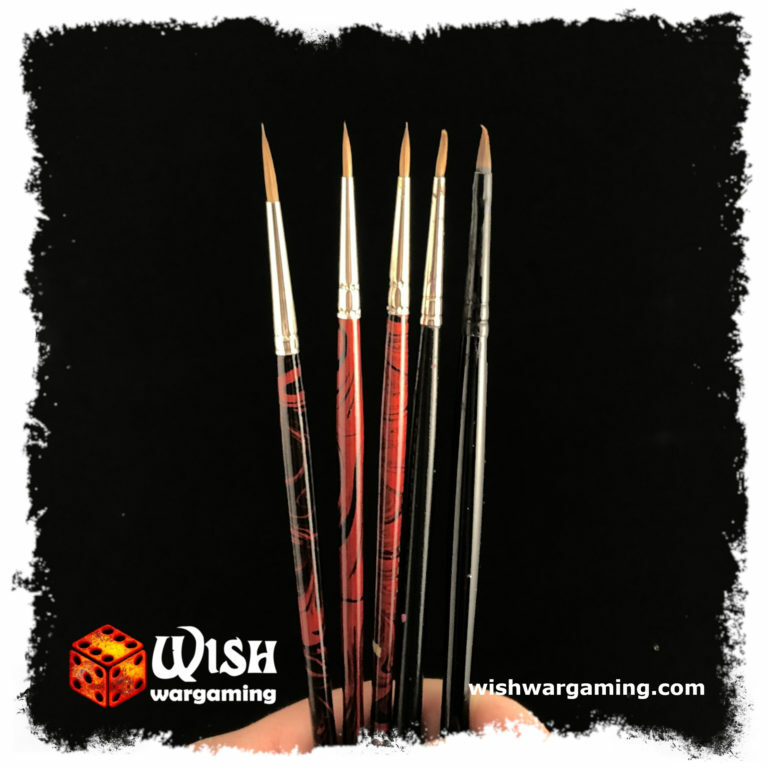 Fan – looks just like it name says, rare one in our hobby, some people use it for applying weathering pigments to miniatures and vehicles. Yes it does, especially when it comes to brushes. There are different range of sizes deppending on brush types, starting from 0000 as the smallest one i’ve saw. The higher number the bigger the brush is, when it comes to miniature painting I think that maximum usable sizes are around 12 but for working on table terrain even biggest ones from Home Depot Markets will suit it well. Usually brush shape and size indicates its use areas. Smaller ones (000-0) with pointy tip are for details and gentle highlights. Small ones (1) are for highlights and small parts of mini. Medium sizes (2-4) are for applying base paints, washes and drybrushing. Bigger than 4 are dedicated to vehicles, priming and working on terrain parts (here usually starting from size over 10). It’s mostly matter of experience to find what kind of brushes suites you best for different tasks and it varies depending on personal preferences. First and most important rule for using your brush is that you should never dip it in the paint for more than half of it’s bristle starting from its tip. If you take too much paint at one time it will loose it’s sharp tip after first stroke and more important is that your brush will wear down very fast from this. That’s because paint will go inside ferrule (bristle metal casing) and after hardening it will distort it’s natural shape making it look lika a broom. It’s very hard and sometimes impossible to bring your brush back to its starting condition after this. 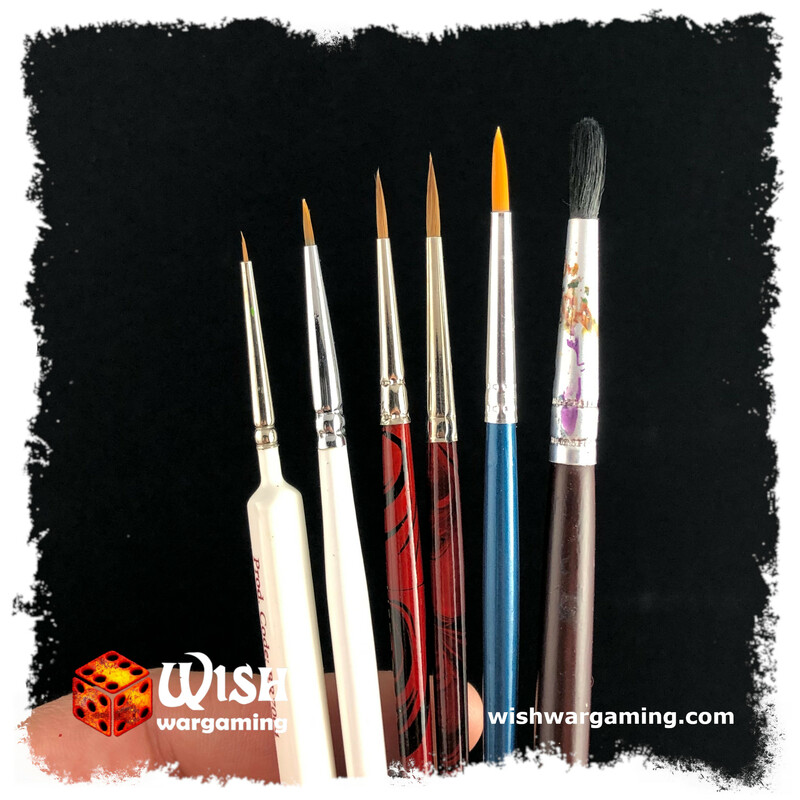 If you see that you need more paint that half of the brush bristle is able to deliver the solution is simple – you need to take bigger brush or with different shape. Second thing is to always clean your brush in water after finishing or pausing even for few minutes during painting. 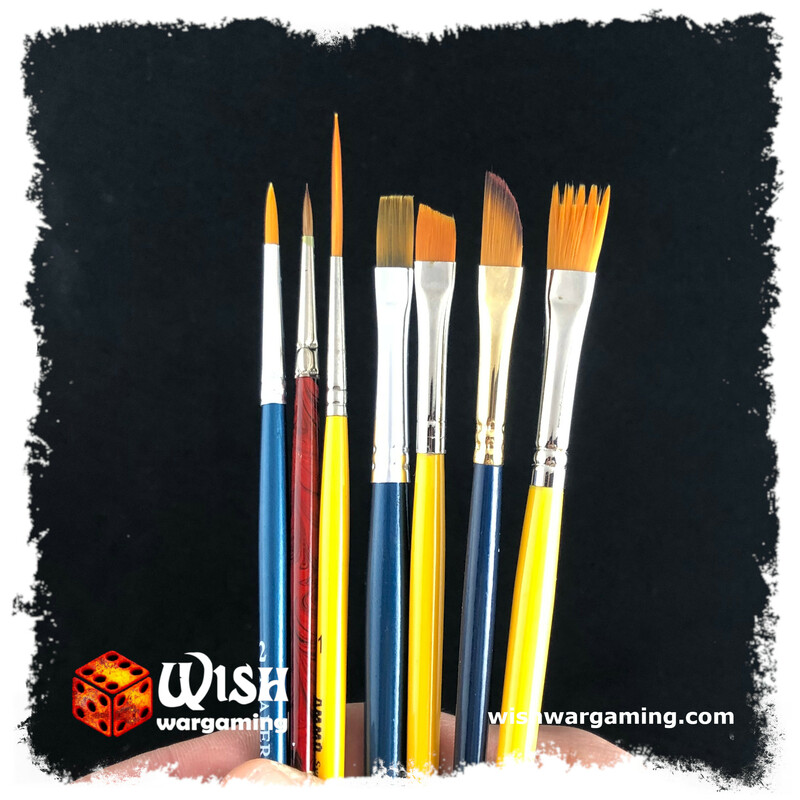 Paints dedicated for miniatures painting (mostly acrylic) dry usualy in seconds or minutes depending on their thick and consistency. If you’ll leave them on your brush you’ll have to use water or in worst case some kind of acrylic paint solvent. This also is not too good to your brush and after few times it can really matter for its durability. Also try to keep clean its ferrule and handle – it don’t have any impact on the durability but just make your tool look nice and tidy. Also important is to as much as possible form your brush bristle to its natural shape, especially if you take longer pause during painting and always do that after you finish painting. Some people use for that their lips (including myself) but the best solution for the people that didn’t develop bad habits yet is to use your fingers and/or wet cloth turning brush around it’s axis. Another thing is that you never should is to leave alone your brush in water or container leaving it hair at the bottom or in the way that its natural shape will be distorted. Same reason as above – this will kill your brush very fast. Put it upright with bristles in pot or put back on them it’s protective silicon casing (if you have managed not loose it yet 🙂 ). I think that these are those most important rules that will help to extend life of your tool and to keep it’s tip sharp all the time. You should remember that sooner or later your brush will eventually wear down, but then you can try to regenerate it or adopt it to different types of work after that. Depending on brush shape and type after they will loose their natural tip you can always try to regenerate them or modify them a bit to get a tool for something else. First thing you should always try is to restore the natural tip of your brush. Especially this is first thing to do for brushes with natural hair. For this you can use everything that can dilutes and dissolves the paint that you are using. For acrylic paints this can be for example hot clean water (best from tap not boiling one from kettle) which not always will give you best possible result but is the cheapest way and in most cases will be enough. You can use also some acrylic paint thinners or solvents, and there are also on the market products dedicated for restoring your brushesh. Their price varies from 3 – 25 EUR per bottle, which can be enough for few years. Whatever you are using the main idea is to put your brush with its hair to the bottle or jar filled with something above, leave it there from few hours to few days (time depends on what you are using). After that take it out and clean bristles using cloth or soft tissues. 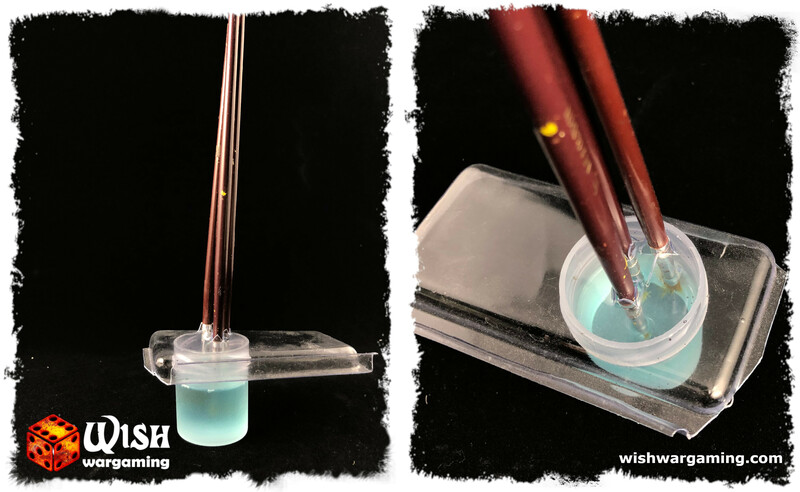 This will work for every natural and most of synthetic brushes that are gently distorted – it should bring back their natural shape and spring time close to original point. It won’t help if your brush looks like a broom already in most cases. Sometimes, mostly on synthetic ones, you’ll find that fibres tends to bent outside, to correct this you can try to use some device which can produce steam (kettle with boiling water, iron with steam option) – hold brush in stream of steam for few seconds and then using cloth or fingers try straightening the fibers to the desired shape. If this won’t help and your brushes look like on picture below, you can follow to the next step of this guide. If your brushes looks like those above you can still find them useful. 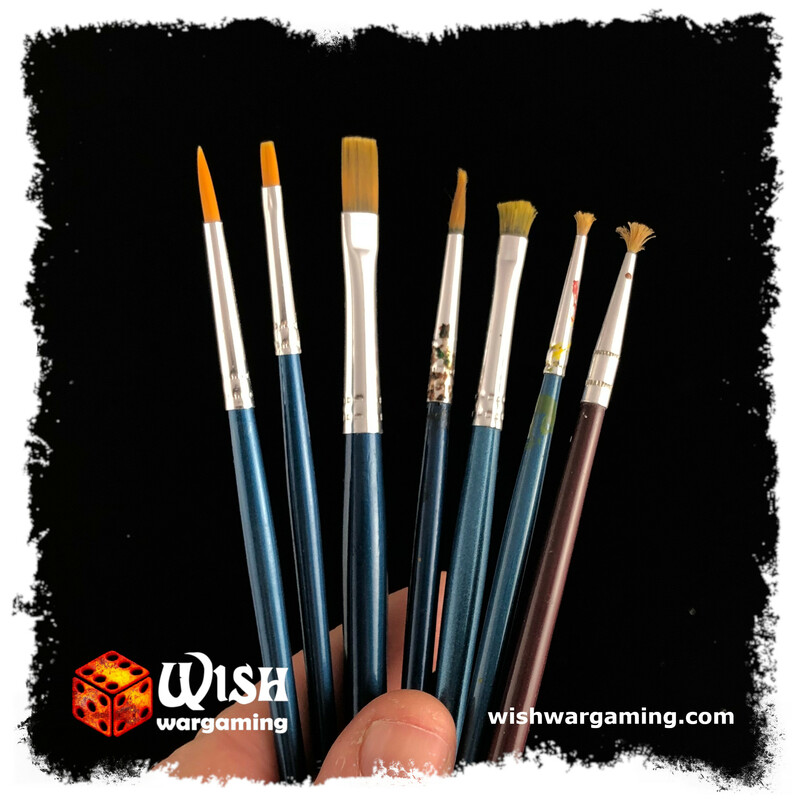 Almost from every kind of synthetic brush type you can make short square brush which will be ideal for drybrushing your models. To do that simply cut 10%-30% top of the bristles in straight line using your hobby knife or fine cutters. The height of the cut depends on the actual condition of the brush but the general rule is to get rid of wrapped and protruding bristles, cutting as less as possible. If you dont cut too much you will be able after some time to repeat this process because from my experience usability of the brush for drybrush is to 30% of the bristles from its original height. This is natural life cycle for most synthetic hair brushes, at least in my workstation. For natural type brushes I recommend you different approach, because even if you cut their top due to their softness they wont be too good for drybrushing. For this kind of brushes its most common that single fibres are starting to stick out from natural shape or ten to lean outside the tip. The more are sticking out the harder it gets to maintain sharp tip. So I recommend you just to try select those single fibres and try to cut them out from their mount in ferrule. At the beginnig i tried to pull them out using tweezers, but sometimes it caused that other fibres were too loose and started to fall out. Usualy this will be fibres from the most outside part, so it shouldn’t be too much problem using your hobby knife or detail cutters. After few times you notice that your brush belly can be smaller – don’t worry, just take look at your brush and maybe its time to lower its tip for 10% to create one size smaller brush. Of course you can use old brushesh for more heavy-duty jobs without any modifications. This can include applying PVA glue or varnish, priming models, drybrushing or paiting large terrain areas. For all this you can use old brushes just like they are, because usually there is no need to pay attention to details during those kind oj jobs and condition of your brush really doesen’t matter too much. From my point of view this are most important things you need to know about brushes. I hope you liked this article and found it useful. 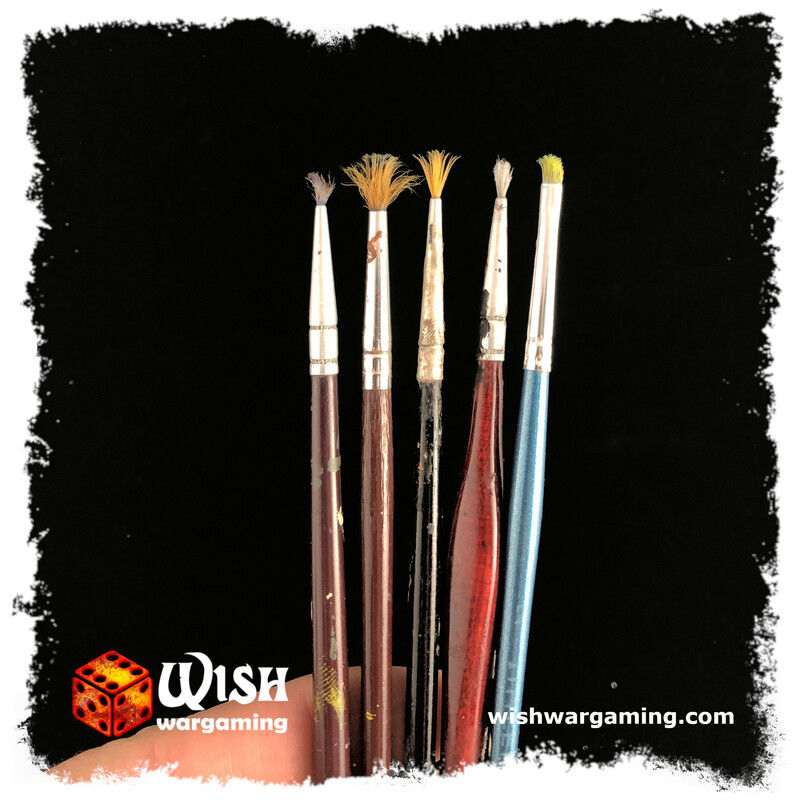 Stay tooned for next article from Wish Painting Tips series and feel free to share your opinion and experience regarding using brushes in comments below!